For the period ending January 19, 2018 ... New DVD and Blu-ray selections added to the DVD & Blu-ray Release Report's database. 01/16/18 — Released Cook Off! 01/16/18 — Released I Voted? It should have received a theatrical run back in the late 1970s, but, sadly, it didn’t and eventually went the direct to video route in 1984 and then disappeared for another 20 years. 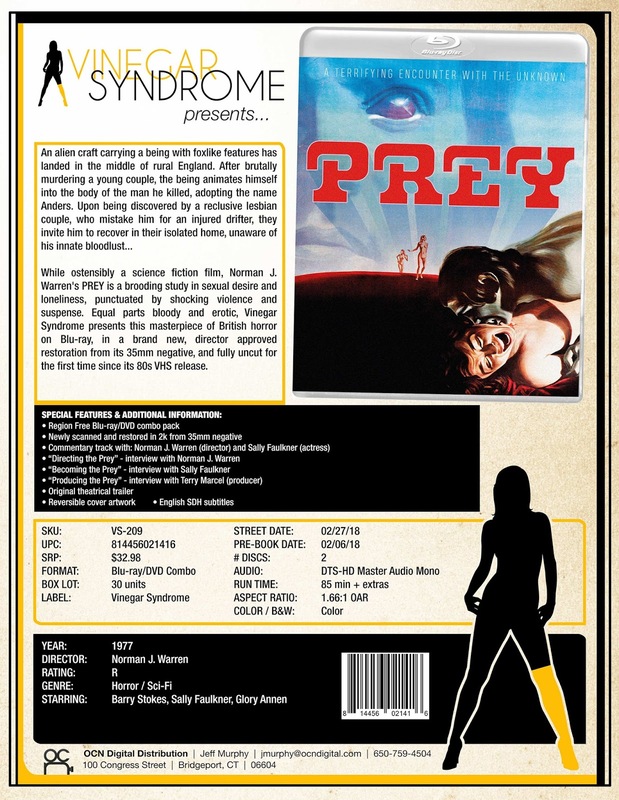 We are talking about the UK-produced sci-fi thriller, Prey, directed by Norman J. Warren (Horror Planet, Bloody New Year, etc.) and starring Barry Stokes (Enemy Mine) as a shape-shifting alien on a mission to survey humans as a potential source of food! His mission gets a little sidetracked when he becomes fascinated with a lesbian couple played by Sally Faulkner and the late Glory Annen. The reason we bring this up is that Vinegar Syndrome announced this past week that Prey is getting a 2K restoration from the original 35mm negative and will be available for genre fans to savor on Feb. 27 as a Blu-ray/DVD Combo Pack. Also on the Feb. 27 release calendar from Vinegar Syndrome is Jamaa Fanaka’s 1982 hit sequel, Penitentiary II, starring Leon Isaac Kennedy as former convict Martel “Too Sweet” Gordone. This is a 2K restoration from the original 35mm camera negative and Penitentiary II will be available as a Blu-ray/DVD Combo Pack. It should be noted that Jan. 30 is the street for the original, Penitentiary … Vinegar Syndrome will be serving-up a Blu-ray/DVD Combo Pack — it is a 4K restoration also featuring commentary from filmmaker Jamaa Fanaka and other bonus goodies. Also on the Feb. 27 release calendar as a Blu-ray/DVD Combo Pack release is director Bernard Morris’ 1976 shoot-on-film adult classic Mary! Mary!, starring the legendary John Leslie (over 300 film credits before his untimely death of heart failure in 2010), with co-stars Constance Money (The Opening of Misty Beethoven) and Sharon Thorpe (she also teamed with John Leslie in filmmaker Anthony Spinelli’s 1978 adult film, SexWorld). Vinegar Syndrome has lined up a 2K restoration of Mary! Mary! from the original 35mm camera negative! 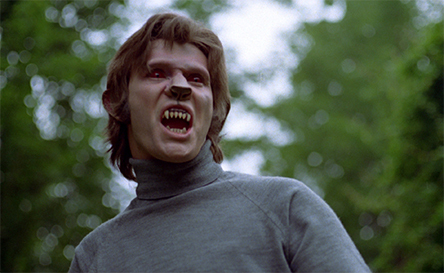 And speaking of adult filmmaker Anthony Spinelli, his 1975 adult-thriller, Night Caller, has been given a new 2K restoration by Vinegar Syndrome and will be available on Feb. 27 as a DVD product offering. And last, but not least, the company’s popular “Peekarama” DVD line of products will see its next entry on the 27th with the double feature release of Sessions of Love Therapy (1970, featuring Rene Bond, Sandy Dempsey and Suzanne Fields) and 101 Acts of Love (1971, starring Lindis Guinness). Icarus Films will be delivering the France-based Distrib Films thriller, The Assistant, to the domestic DVD marketplace on Mar. 13. The French filmmaking team of Christophe Ali and Nicolas Bonilauri (who also teamed for Camping Sauvage in 2005) deliver a twisted tale of misguided revenge that features a tour de force performance from the incredible Nathalie Baye (four-time César Awards-winner — Every Man for Himself, Strange Affair, La Balance, Le Petit Lieutenant) as a grieving mother who slowly comes unhinged. We meet Thomas Lemans (Malik Zidi — Poison Friends, Changing Times, etc.) as he is rushing to the hospital — with his very pregnant wife — in the rain, at night, when the unthinkable happens, he hits a young man. He does not flee, but instead stops and tries to help the dying lad, he gives him comfort, calls for help and then he is gone. It is a tragic accident. The mother, Marie-France Ducret (Nathalie Baye), is, understandably, grief stricken over her loss. But, we soon discover that her loss, her grief, metastasizes into an insane plan of revenge … a nine-year plan to get revenge upon Thomas and his family for the death of her son. Talk about creepy!!! She becomes his secretary at the architectural firm where he works — he does not know her as the mother of the young man he killed. She strikes up a relationship with Thomas’ father, and eventually marries him (we said it was creepy). Nine years of waiting, plotting and now she is in the heart of his family. 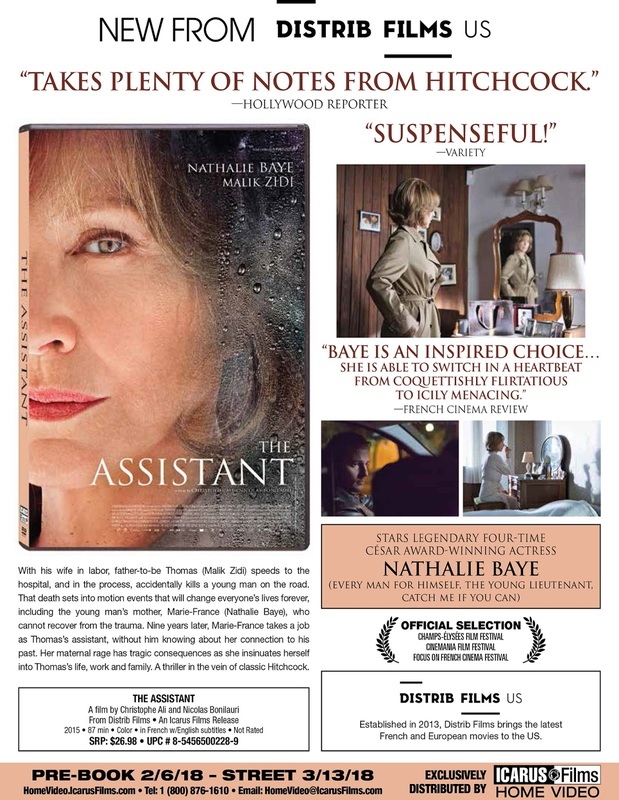 Buckle-up, Nathalie Baye delivers a performance that would make a black widow blush with envy and Alfred Hitchcock proud!! 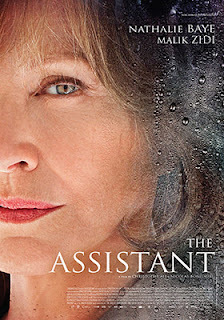 The Assistant is presented in French with English subtitles. Last week Walt Disney Home Entertainment announced back-to-back street dates for both the animated smash, Coco (Feb. 27), and the super-hero blockbuster, Thor: Ragnarok (Mar. 6). With this done, Warner Bros. Home Entertainment wasted absolutely no time in jumping into the fray on Mar. 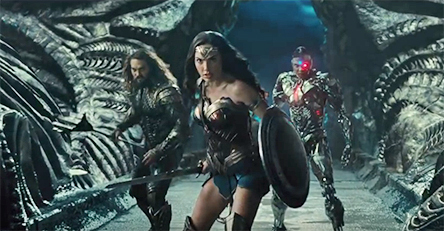 13 with a four-SKU helping of their own super-hero hit, director Zack Snyder’s Justice League. The ARR comes in at 116 days and domestic box office receipts currently stand at $227.5 million. 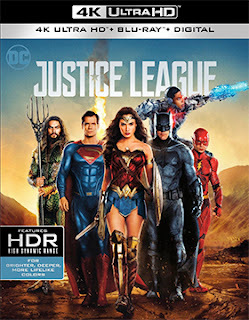 Planned for delivery to the home entertainment marketplace are a stand-alone DVD edition, a Blu-ray/DVD combo pack, a double-disc Blu-ray selection featuring both 2D and 3D viewing options and a 4K Ultra HD/Blu-ray combo pack. Lots of choices for Justice League fans!!! 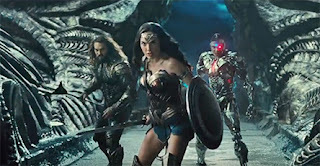 In a post-Superman world, Lois Lane (Amy Adams) is in mourning and a smorgasbord of (DC) super heroes — Batman (Ben Affleck), Wonder Woman (Gal Gadot), Aquaman (Jason Mamoa), The Flash (Ezra Miller) and Cyborg (Ray Fisher) — are pitted against the timeless Steppenwolf (voiced by Ciarán Hinds) and his legion of flying demons. Will they be enough to stop the destruction of our planet? Can hope be “resurrected” (is that a spoiler?) to overcome Steppenwolf and his hellish creatures? Join the fun on Mar. 13 and all will be revealed! Bonus features common to all SKU configurations include a half-dozen featurettes — “Road to Justice,” “Heart of Justice,” “Technology of the Justice League,” “Justice League: The New Heroes,” “Steppenwolf the Conqueror” and “Suit Up: The Look of the League” — plus four specific “Scene Studies” (Revisiting the Amazons, Wonder Woman’s Rescue, Heroes Park and The Tunnel Battle). 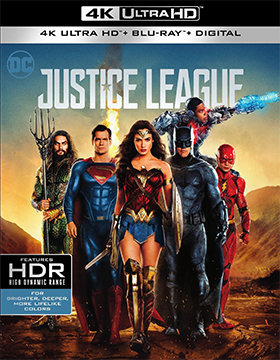 Exclusive to the Blu-ray and 4K Ultra HD product offerings are the featurette titled “The Return of Superman” and bonus scenes not shown theatrically. Arrow Video, with domestic sales and distribution support provided by MVD Entertainment Group, has staked out Mar. 27 as the release date for a new 4K restoration (from the original camera negative) of writer/director Stephen Chiodo’s 1988 tongue-in-cheek sci-fi/horror film, Killer Klowns from Outer Space. With Stephen King’s It making clowns scarier than ever — come on, you know in your heart of hearts that clowns are just creepy by nature — it didn’t take long for Arrow Video to update this alien clown tale with a new Blu-ray release chockfull of extras. Much like the 1958 Steve McQueen/Aneta Corsaut sci-fi thriller, The Blob, we are introduced to two “high school” kids out for an evening of “necking” at the local lover’s lane. 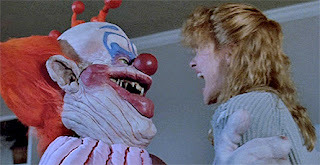 These would be Mike Tobacco (Grant Cramer — Hardbodies, New Year’s Evil … and the forthcoming release (September of this year) of The Return of the Killer Klowns from Outer Space in 3D) and his main squeeze, Debbie Stone (Suzanne Snyder) — don’t you just love those name Tobacco and Stone!!! Pretty soon the night sky lights-up and something lands (or crashes) in the nearby woods. 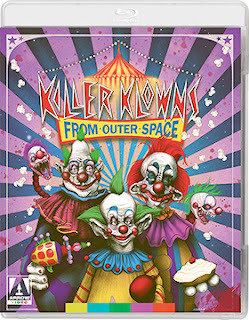 Buy unlike The Blob, this alien craft looks like a circus tent and Mike and Debbie are soon confronted by an alien invasion of … Killer Klowns!!! 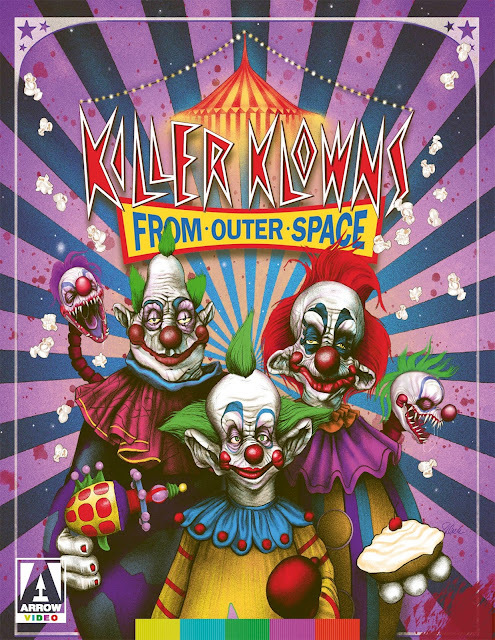 Lastly, there are deleted scenes (with commentary) a blooper reel and Klown auditions. CBS Home Entertainment and Paramount Home Media will be teaming up on Mar. 6 for the three-disc DVD debut of The Good Fight: Season One. This is the debut series from the newly-launched CBS All Access subscription streaming service … Star Trek: Discovery, based on this announcement for the home entertainment marketplace launch of The Good Fight, should follow soon. 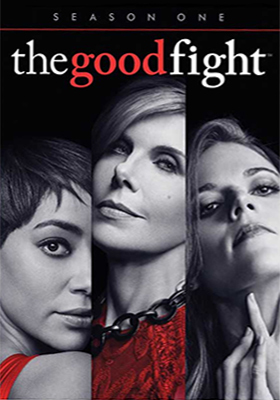 When The Good Wife series ended there was major loose end (a monster financial scam) and this series picks up with Diane Lockhart (Christine Baranski) disgraced and in ruin … and forced out of her law firm. She has to start over. Presented here are all ten episodes from the series first season. 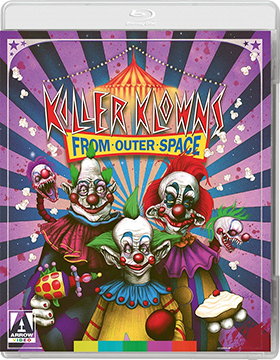 Bonus features include a gag reel and deleted scenes. He’s known locally as the Braxton Butcher, a looney tunes teen by the name of Tommy Miller. 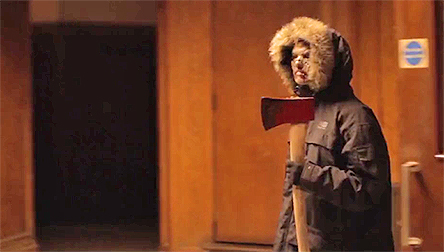 He butchered his classmates and lumbered off into the nearby woods … never to be seen again! Until now!! 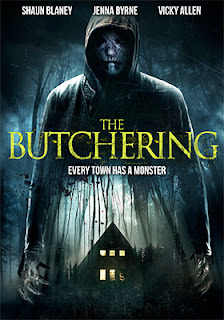 Belfast filmmaker Leo McGuigan’s slasher flick, The Butchering, will be making its domestic DVD debut on Mar. 27 by way of Wild Eye Releasing, with MVD Entertainment Group providing sales and distribution expertise. Filmed on location in Belfast, we are introduced to Tommy (Oisín Cash), a bullied kid, who snaps at the annual “Town Hall” party and hacks up a bunch of his tormentors. Before he can be subdued, he escaped and literally dropped out of sight … gone! After the carnage, we skip ahead ten years and we are introduced to a young Belfast detective by the name of Ryan Fenton (Shaun Blaney), who just happened to be one of the “Town Hall” party guests who managed to survive Tommy’s onslaught. 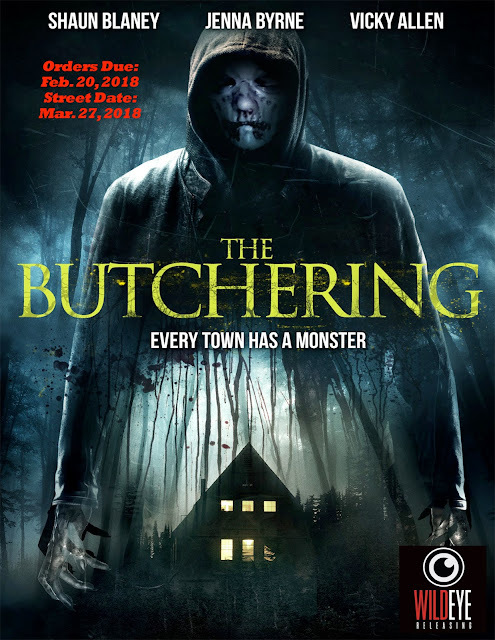 He’s on a new a case, a new “slasher” case, and all the clues point to the return of crazy Tommy, the Braxton Butcher!!! The Butchering will keep you guessing … is it Tommy, back for another round? Or, is this an insane homage to the legend of the Braxton Butcher being perpetrated by a copycat? Either way, the body count will mount and blood will flow!